Take Charge Brandi Continues in Grade One 2014 Starlet Stakes: The Grade One Starlet Stakes, which was previously run at Hollywood Park, is hosted this year at the California track, Los Alamitos, who recently implemented a thoroughbred racing meet. 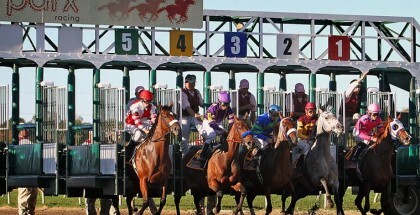 The race will take place on Saturday, December 13 as a part of the points races on the Road to the Kentucky Oaks. The race is run at 8.5F on the main track. Take Charge Brandi, pictured above in the Breeders’ Cup Juvenile Fillies, is obviously the horse to beat in the 2014 Starlet Stakes. Over the years, the Starlet has worked nicely as a good prep for competitive three-year-old seasons. In the past 14 years, 8 fillies have gone on to start in the Kentucky Oaks, and 2010, Blind Luck won the Kentucky Oaks after using the Starlet as a prep as a juvenile. On the 2014 list of entries for the Starlet are Take Charge Brandi, Feathered, Maybellene, and maiden filly Danette, among a few others. The big question is; if Take Charge Brandi wins the Starlet, can she steal the 2014 Two-Year-Old Filly Eclipse Award? History is actually against the Giant’s Causeway filly, as the last filly to win an Eclipse Award with the Starlet on their resume was in 1984 when Outstandingly took the title. Take Charge Brandi is obviously the horse to beat in the race. The Giant’s Causeway filly is coming into the G1 Starlet on a two-race win streak, which included the Delta Downs Princess (G3) and the Breeders’ Cup Juvenile Fillies (G1). Take Charge Brandi has seem to put it all together in the last month after having three off the board finishes in graded stakes races. Will a Starlet win get Take Charge Brandi an Eclipse Award and make her the early 2015 Kentucky Oaks favorite? Take Charge Brandi is not the only filly with ability to win the Starlet. 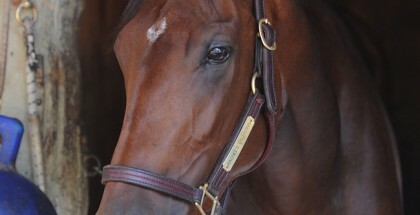 Feathered will be making her first start back since the Breeders’ Cup Juvenile Fillies. Todd Pletcher believes the filly has something special, as she was sent to the Breeders’ Cup to make only her fourth start. Feathered only had a mild kick in her third place finish in the G1 Frizette where she finished third. In the Breeders’ Cup, program notes describe her fourth place finish as “hanging.” Can Feathered get the 8.5F or is she a future sprinter? Jerry Hollendorfer, known for training this year’s previously undefeated Shared Belief, sends out the filly Majestic Presence, who was able to gain the third place finish last out in the 8F Delta Downs Princess (G3) behind Take Charge Brandi. Pedigree states that Majestic Presence should benefit from the stretching out another 1/16 mile, but can she beat an improving Take Charge Brandi? 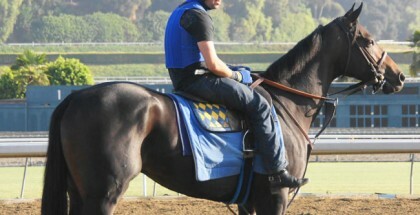 Feathered, pictured above, will be making her first start back since the Breeders’ Cup Juvenile Fillies. Todd Pletcher believes the filly has something special, as she was sent to the Breeders’ Cup to make only her fourth start. Maybellene, a Bob Baffert trainee from the first crop of Lookin At Lucky, is looking to step back into graded stakes company after a disappointing 11th in the G1 Chandelier behind Angela Renee. 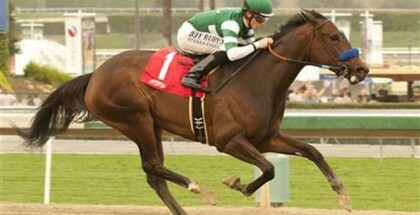 She most recently finished second in the Desi Arnaz Stakes (L) at Del Mar going seven furlongs. She was “willing,” only losing by a neck. Being out of a Giant’s Causeway mare, Maybellene may only need time to mature to become a graded stakes winner. Can she turn the tables on this field? As always, the maiden Danette shows up for the Desormeaux brothers. Danette has always been close, but has yet to his the wire in front. She was fifth in the Breeders’ Cup Juvenile Fillies after being jostled at the start and put on the rail before getting blocked behind horses. Before that, she was a driving third in the G1 Chandelier. Can Danette run down a speedy Take Charge Brandi at Los Alamitos? The Chandelier is not an Eclipse Award winning race, but will voters give a nod to the improving Take Charge Brandi or remember the undefeated Lady Eli, winner of the Breeders’ Cup Juvenile Fillies Turf? History is against Take Charge Brandi, but she may run right into the history books with a win in the G1 Starlet. However, if one of these other fillies wins the race, what does that say about Take Charge Brandi? Will the Starlet serve as a notable prep for these fillies, trying to find the starting gate on the first Friday in May? The Starlet Stakes is the 8th race on the Los Alamitos Saturday card with a post time of 4:00 PM PT.